Mercury continued to soar on Sunday in major parts of the country with Odisha’s Titlagarh scorching at 48.5 degrees Celsius even as four districts in Assam were hit by the first wave of floods affecting around 45,000 people. Titlagarh has been experiencing extreme heat for the past several days and Sunday the town recorded its highest temperature for the month of April in the last 17 years. 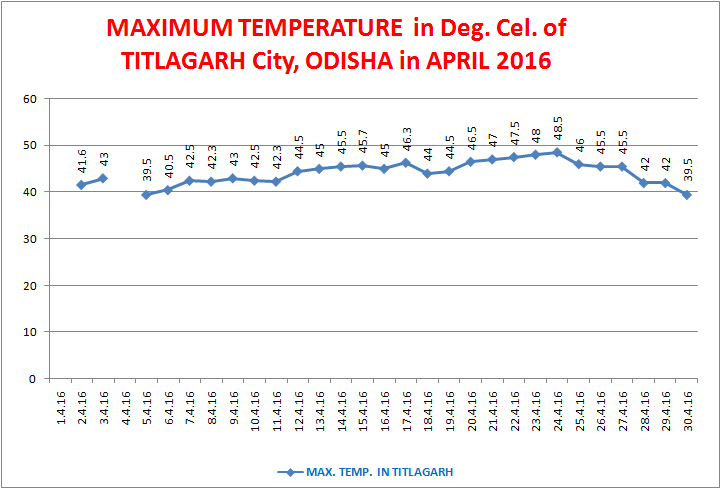 “Titlagarh had crossed 50 degree Celsius mark in 2003 on June 5 when it posted 50.1 degrees Celsius. Also, for the month of April, it is the highest since 1999 when on April 30 that year the place had registered 48.1 degrees Celsius,” Director of Meteorological Centre in Bhubaneswar Sarat Sahu said. The Odisha government has confirmed four deaths due to sun stroke, however, the suspected casualty list in the state due to heat wave has grown from 79 to 88. Bihar too continued to sizzle under intense heatwave even though mercury dipped marginally at several places, including in the capital town Patna. Patna remained the hottest place in the state for the second day on Sunday with maximum temperature at 41.1 degrees Celsius against 43.3 degrees C yesterday, while Gaya recorded the highest day temperature at 41.1 degrees C.
Steel city Jamshedpur in Jharkhand also scorched at 45.8 degrees Celsius. In national capital Delhi, however, the mercury remained below 40 degree Celsius mark. The maximum temperature settled at 37.3 degrees Celsius, a notch below the normal, while the humidity level in the air remained on the lower side, oscillating between 13 per cent and 56 per cent. In West Bengal, Bankura district touched the highest at 43.8 degrees Celsius while Kolkata recorded an above normal 40.2 degrees Celsius, even as the MeT department forecast heatwave to continue for at least another four days. In districts of Gangetic West Bengal, the mercury hovered slightly above the 40 degree Celsius mark, they said. Burdwan, Asansol and Sriniketan recorded 41.5, 41.6 and 41.7 degrees Celsius, respectively. In south India, Chennai, Hyderabad and several other cities recorded temperature above 40 degrees Celsius. Hisar in Haryana recorded a high of 39.4 degrees Celsius. Chandigarh braved hot weather at 35.3 degrees Celsius. In Punjab, Amritsar recorded a high of 35.8 degrees Celsius while Ludhiana and Patiala recorded maximum of 36.5 degrees Celsius and 36.6 degrees Celsius respectively. As Assam battled with the elements, State Disaster Management Authority (ASDMA) there said, so far over 1,018 hectares of crop area has been inundated by flood water, while Burhidihing and Desang Naglamuraga rivers were flowing above the danger mark in Sivasagar.